Composed by Erwin Schulhoff (1894-1942). This edition: Saddle stitching. Sheet music. Schott. Composed 1926. 23 pages. Duration 15'. 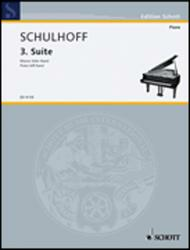 Schott Music #ED8105. Published by Schott Music (SD.49007782).